We don't always get a chance to get out spearing during winter or other cold, windy, cyclone season and dirty times of the year. So when we do get out after a long spell from the water, it is important that we have kept our dive-fitness up so that we can completely enjoy each spearfishing trip. We are often asked: 'How can I increase my lung capacity? '; and 'What exercises can I do to improve my spearfishing?'. There is no easy, correct or incorrect answer to these questions. Every spearfisher is different in development, fitness and how they improve. But this blog will give you a few general hints and tips on how to keep spearfishing-fit during those dry months. There are some great water sports that will help your confidence, comfort, and fitness in the water. Underwater Hockey is the most popular underwater sport in Australia. 6-7 players on each team wear mask, snorkel and fins, a thick protective glove, and a short 'hockey stick'. The puck is weighted on the bottom of the pool, and two goals are placed at either end of an approximately 20m area. Players have to hold their breath and fight for the puck, working as a team to get the puck in the other sides goal. It is a lot of fun and improves your fitness. Underwater Rugby is another underwater sport which is growing in popularity, and while it hasn't reached Brisbane yet it is in full swing in Sydney. The aim is for players to fight for a heavy ball unerwater and pass it amongst team members with the aim of getting the ball into a 'bin' at the other end of the pool. The first thing you need to know about pool training is don't do it alone. You need a buddy watching you closely the whole time. While pool training helps with breath hold, fitness, and lung capacity it doesn't necessarily translate into spearfishing depth. It isimportant to remember that freediving and spearfishing are very different sports, just like depth and dynamic are different disciplines. Just because you can swim 50m underwater it doesn't mean that you can spear at 25m. Try mixing your pool training up - swim to 25m and hold a weight belt in the midle of the pool to stimulate bottom time and focus on getting your heartrate down before completing the rest of the lap. You could also create extra drag to stimulate diving against the current. Practiced in a safe environment, pool training can be a great supplement to spearfishing during those out-of-water weeks. Even if you don't have a buddy to do dynamic training with, just swimming laps is always a great way to improve fitness. The important thing with building fitness is to keep active. Walk faster, park your car that extra block away, get out for a bike ride, climb a mountain, go for a hike and set up a picnic. These are all easy things that you can do while you're not in the water which will help to keep you in top cardio form. The fitter you are, the lower your heart rate will be, and the less oxygen you will be using in the water. If all else fails - keep learning! If the weather outside isn't even suitable for some of the above activities, you can jump on the computer and do some research. There is always something new to learn about spearfishing - a new species to read up on, a new video to grab tips from etc. If you can't improve your fitness outside, improve your knowledge by reading up on Shallow Water Blackouts and help educate your friends and spearfishing club to form safe spearfishing practices. The more knowledgeable you are, the better dive buddy you will become. For more information on why general health and fitness is important for diving, as well as a stack of information on spearfishing, visit the Spear Safe website. If you don't have time to go for a run, a ride, play a sport or jump in the pool, there are other ways to improve your spearfishing, like working on your breath hold or lung capacity. It is important to remember that your lung capacity and breath hold will naturally increase as you spend more time spearfishing. However, we know that you are all keen and want to be hunting fish effectively as quickly as possible. The safest way to reach new goals is to dive and train with a buddy at all times. One product that we recommend for people wanting to improve their fitness and lung capacity is the Power Breathe range of products. 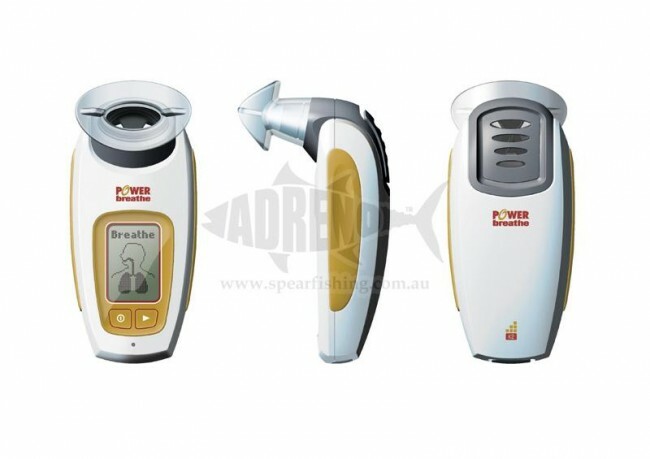 Adreno stocks the entire range from the $89.00 model to the professional, digital model which is $499.95. You can use Power Breathes in the car on the way to work, or at home while watching TV, and they will improve lung capacity and fitness. - Look up C02 and 02 tables to work on your static (dry) breathholds. - Practicing holding your breath while doing something physical like walking (even if all of the walking you do is from your office to the toilet!). You may want to count how many steps you can hold your breath for and work on doing a couple of extra steps a day.